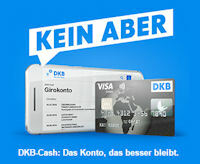 DKB Giro- or Credit Card? Which one do I choose for what purpose! Website of the “Kein-Aber-Strategie” (no-but-strategy) – the DKB-account is and remains free of charge! – more and more people switch with their current account to the DKB. Many of them were (or still are) customers of the savings banks and Volksbank. Often, there is only one free card to their accounts – although many banks of this sector have introduced fees for them too. Video shows: Which card to use cleverly! You can find further instruction videos on our YouTube-channel (subject to subscription). If you are not yet a customer of the DKB, you can become one here: www.dkb.de/kontoantrag. Which card do I use for what purpose? (detailed instructions will follow) applies to card payments and cash withdrawals at the ATMs in the foreign currency abroad, ideal for journeys! Personal note: in my wallet, I only carry the DKB Visa Card. This is sufficient for me. The Girocard stays at home. Questions to the use of the DKB-cards? My team and I would be pleased to help you personally when discovering and using the clever possibilities of the DKB-account. Please ask your questions through the comments box at the end of this page. You are also welcome to contribute with the descriptions of your own experiences and ideas, so that new customers will get used to the new account and the new cards. An exchange between smart bank customers is desirable. This is the purpose of our life and work here! I personally prefer to pay with the DKB Visa Card, because all card transactions are “saved” free of interest until the end of the month and are settled with the current account then. The interest advantage applies, if there is not enough money on the current account and the overdraft-interest would be charged. From the perspective of the customer, it is clever to pay with the Visa Card. By the way: cash withdrawals are also free of interest until the monthly settlement. This is a just like a free loan! However, there are also people, who prefer the immediate debiting of card payments from the current account. They say that they have a better overview of their finances and therefore, do not spend more money than they actually can afford. The DKB only offers you several possibilities – you can take advantage of what you like and what fits to your needs. And if you like, you can share your tips with other readers here through the comments feature. The DKB offers to new, but also existing customers, to use an account switching service. Many people, who have already used this service, enjoyed a true time saving and pleasant comfort. We have presented this service on the following page to our readers: DKB Kontowechselservice (account switching service). Recommendation: Test the account and cards extensively before the switching! This perhaps also includes a call to the customer service at an unusual hour, e.g. on Sunday or at night. You will be surprised by the good assistance and information for its customers provided by the bank outside the usual opening hours! The phone number is: 030-12030000. This is a Berlin area code + die DKB-bank code. Perhaps this way, you can remember it even easier? I am confused by these accounts. What would I use to pay my landlord rent, for instance or my bills like cable and electric. I have applied for an account, and am waiting to hear. I am not wondering however, If I have opened the wrong type of account. I do not want to just use a Mastercard in shops, and restaurants. This sounds more like a paid credit card. Do you live in Germany? Do you really have a DKB account? Usually electricity bills and other consumption costs of dwellings are debited from the checking account by direct debit. The transfer of the rent is mostly set as standing order. DKB does not have a Mastercard, but a V-Pay Card (debit Girocard) and a Visa Card (credit card). I currently am living in the USA. I will move to Leipzig in March. I opened the account online. I am simply not familiar with the German way of Banking. In the USA you must usually write a check, unless you have direct debut set up with your bank. I was simply wondering the purpose of two cards. FYI I have lived in the USA all my life, although I am a German Citizen. I like Americans a lot and am not surprised about “Americans” being surprised that some things in the rest of the world function a bit differently from home. I think you will manage with the German payment transactions. Many find it to be quicker, more practical and cheaper than in the US – but it is in the German language. I am not sure if I have an account yet. I completed the video ID, and DKB asked me for proof of my address in the USA to send the cards. I am assuming they approved my application. The card production with DKB takes approx. 2 weeks, and sending them to the US with the postal services takes an additional 1-2 weeks. The other said Registrierungs code. that was a long number with bothletters numbers and dashes. I have no idea what these numbers are for. Then it requests your eight figure password. Where do I find that in any of the seven letters I am supposed to receive? Since I last posted to you, I have heard back from DKB. The cards are in the post, and should arrive by sometime next week. I am now understanding a bit more. The cards are like a credit card, and a debit card. For paying bills I would use a direct debit, the same as I do here. I am only still confused as how I will do that. I am presuming the utilities will tell me their BIC number etc to send them money. I have now opened my account. Have made a transfer into, and one out. However, I am still confused. When I move to Germany in three weeks. Do I use the Girokonto account to pay bills? I do not understand how the Kredit Karte account works as a Savings. Would I keep all my savings in the Kredit account, and less in the Girokonto account? In the us there is nothing similar. A Credit Card in the USA is exactly that. You use it for purchases like appliances, furniture, or a hotel room. Then you are charged interest on those purchases until it is paid off. It is basically a loan. The Kredit Karte account on the other hand pays YOU interest. This is strange to me. In the USA only a Savings Account pays interest. Then you also have a checking account to pay bills ( but also purchases ) When you pay a bill direct, they still are issued a check from your account. However it comes directly from the Bank on a specified date. So this is all new to me. Right now, I have all the money I transferred in my Girokonto Account. Should I divide it among both accounts? Of course, banking in Germany differs in some ways from the one in the US. Our banking system is much more modern and faster. I know both systems. In many cases, a Paybill function will trigger a postal check and this will take 5 days! In Germany, you simply transfer money. At DKB, the transfer does not cost $25 dollars, but nothing. The transfer is credited to the recipient on the same or the next day. This also applies to transfers to other Euro countries such as Austria or Spain. If you want to pay bills, use the function “Überweisung” in the Giro account. Many providers (for example mobile phone, electricity, newspaper) offer you to deduct the amount from your checking account on a monthly basis. This is safe, it’s free and convenient. It’s called “Lastschrift” and works mostly like an ACH debit. The opposite is a standing order or “Dauerauftrag”. The same amount will be sent to the same account every month. Many Germans use this to automate the rental payment for an apartment. This is free of charge as well! With a credit card you can pay similarly to the US. In the countryside and in smaller shops sometimes the acceptance is lacking. You do not have to use the Visa Card as a savings account. I do not do it, I always let it go into minus. But there are people who do not have such a large credit line and then at least get interest for money booked on the Visa Card. In the current low-interest phase it is not as much as before though. The lending interest rates at only 6.9 percent are considerably cheaper than in the US. When opening an account from abroad, your credit line on the Visa Card will probably be only € 100. This means that if you want to use the card, you first transfer money from the Giro account to the credit card. The credit card limit consists of the credit line (currently low for you) and, if necessary, the additionally transferred amount. When you later have your salary paid to the DKB checking/Giro account, you can receive a credit line of up to three times the amount on the account and on the credit card – up to a maximum of 15,000 Euros. Of course, this will not happen on the first day because you do not have a good “credit history” (here it is called “Schufa Score”) in Germany yet. I hope that these explanations help you to find your way around faster. Otherwise, please ask again. Enjoy discovering banking in Germany! Thanks. I have transferred a fairly large amount to the Girokonto Account. But so far none into the Kreditkarte Account. Do I need to transfer funds into the Kreditkarte account to use it. It shows a zero balance. Normally I would use a debit card to make purchases. A friend who also has a DKB account says he never uses the Girokarte, just the Kreditkarte. That is where my confusion comes in. He said he puts all his money into the Kredit Account. I rarely use my credit cards, unless I’m traveling to rent a hotel room, a plane ticket etc. Otherwise I use my debit card or pay cash. It is great to hear you have a friend who helps advises you on the use of means of payment. Enjoy it!